New to rice? You’re in luck. Here at VeeTee, we’ve got the inside scoop on the best rice dishes from around the world, so we can take you on a culinary adventure! You’ll fall in love so fast that you’ll never want to be without rice again. You say curry! We say rice! It’s hard to imagine a better pair, isn’t it? Throughout India, North Africa, and the Caribbean, rice is transformed as an accompaniment to fragrant spices and hot, hot, hot sauces. Option 1: Stay somewhat traditional with our Simple Prawn & Tomato Masala. Option 2: Take a culinary trip to North Africa via our Chicken Tagine with Saffron. Rice doesn’t have to be a side dish. In the Mediterranean, rice becomes a centrepiece in some of our most-loved comfort dishes. Option 1: Keep things fresh with a delicious Italian Lemon & Rocket Risotto. 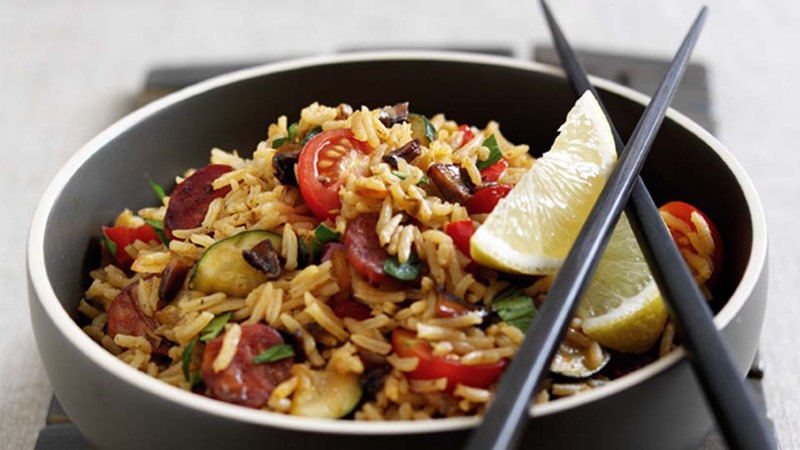 Option 2: Whip up a Speedy Paella – great for a simple evening meal or a vibrant fiesta! Rice is also a great addition to a balanced diet. Eat it as part of a salad to keep you feeling fuller for longer, while enjoying a lighter meal. Option 1: Add a little extra oomph to an old favourite with our Greek Style Rice & Feta Salad. Option 2: Ramp up your 5-a-day with our Rainbow Rice Salad – packed with healthy veggies and tasty spices. Here’s a tricky one! In East Asia, chopsticks have been used as eating utensils for over 6000 years. You might not have that long to master the art, but you can give it a good shot. Option 1: There’s no better way to try your hand at chopsticks than with a traditional bowl of Egg Fried Rice with Prawns & Peas. In Mexico, there’s no better way to eat rice than wrapping it in a tortilla. These comforting dishes are hard to resist! Option 1: Try our BBQ Rice Burritos for a meal that really packs a flavour punch. Option 2: Enjoy the gooey, cheesy goodness of our Baked Beef Enchiladas.